Camping sites and caravan parks in the UK and europe. Find Holiday Parks with hire caravans, holiday lodges, camping, caravan and trailer tent information. Thousands of UK holiday parks, campsites, camping sites and caravan parks. Caravan storage and caravan and holiday home hire directories are packed full of sites in the area you are looking for. UK holidays are on the increase. Weather is getting better and there are a large number of caravan and holiday parks that provide holidays and accommodation to suit every need. Some holiday parks are aimed at providing relaxing breaks, others are aimed at beach holidays, entertainment or outdoor adventure breaks. Many Holiday Parks offer chalets and lodges as well as caravan hire. Search our comprehensive directory of UK holiday parks with chalets, lodges, and caravan to hire. Feature your site on gocaravanning.com and up to 10 other sites on the 4theUK network of sites from just £75 per year. Paid for listings appear before free entries and include links and photographs. Buying or selling a caravan, maintaining a caravan, towing advice and much more caravanning information. UK Campsites for tents, motor caravans and touring caravans offer a great way of enjoying the outdoors. Family camping holidays are a low cost way of having a great holiday. A camping holiday can range from just a few pounds a night to more expensive holidays for touring caravans and motor caravans. Campsites are able to cater for a range of holidays to meet all tastes. Coastal camping, countryside camping as well as campsites near to towns provide a flexible holiday. Some sites are aimed at adults only others are geared up for families with play areas and entertainment. Upgraded Tow Car Checker - we have just upgraded our tow car weight checker to make it a lot easier to use. In just a few clicks you can see the tow weights. Compare prices and save money on camping and caravanning equipment. Visit our online camping equipment price comparison and review section. 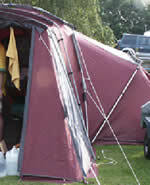 Our camping section provides information on how to save money buying a tent and other caming and caravanning equipment. A wide range of tents are available to buy online.